We are truly in the mobile age now. It has been two years since mobile overtook desktop as the preferred platform for performing internet searches, and even the minority who have yet to come over to that side of technology still use their mobiles and smartphones every day. The world of marketing has, perhaps, been affected more dramatically than any other business discipline by the technological revolution. Digital marketing is poles apart from offline or traditional marketing from days gone by, and the opportunities presented by mobile technology provide yet another avenue for businesses to get their heads around. Let’s take a look. There is a well-known cliché that we all spend most of our lives attached to our smartphones. However, like every cliché, it is based on truth. Just think about it for a moment – how often do you check your phone? Every 30 minutes? 15? 5? According to research, the average person spends five hours of every day attached to their mobile phone. The fact is that people love their mobiles. Despite mobile overtaking desktop for browsing the web, people still only use their smartphones for that purpose around 11 per cent of the time. The rest is devoted to apps. Companies in the US have been quick to see that the single best way of reaching customers is via their smartphones, and by 2019, more than 70 per cent of all digital advertising spend will be dedicated to mobile platforms. Organisations in the UK are rapidly following suit. Mobile marketing is a discipline that is not so different to other aspects of digital marketing but requires some specific considerations that are unique to the platform. Perhaps the greatest obstacle to overcome is the sheer scale of possibilities. With the vast array of mobile apps where you can utilise popups and banners, plus the opportunities raised by direct SMS to targeted customers, it is all too easy to opt for a scattergun approach, resulting in plenty of spend, but limited returns. That is why it is so important to take a strategic approach and to make use of a specialist consultant such as Veoo in formulating and implementing your mobile marketing strategy to generate the optimum return on your investment. With this in mind, we will look at four areas that need to underpin your mobile marketing efforts. The phrase “micro-moment” was actually coined by Google, and refers to the fact that when we look to our phones for information, we want it concise and instant. Mobile marketing is not a time to be going into lengthy detail, so keep the message sharp, snappy and compelling. Perhaps the simplest way of strengthening your mobile marketing campaign is to ensure your existing content and communications are mobile friendly. That means AMP versions of your web pages and ensuring that direct communications, such as emails, are optimised to read properly on smartphones and tablets. As mentioned earlier, not everyone uses his or her phone for browsing and email. Business SMS is a powerful tool for reaching a wide audience, and even technophobic grandmothers send and receive SMS messages these days. However, it is not just about reach. Open rates for text messages are at some 98 per cent, which is far higher than emails, which makes sense intuitively – after all, how many unopened emails do you have in your inbox compared with unopened SMS messages? If you are looking for a product or service on your phone, the chances are high that you need something close by. If you operate a Manchester minicab firm, then you evidently need to pop up for anyone searching for a cab in Manchester but are wasting marketing efforts if you appear when someone is searching in London. Sounds obvious, but most websites fail to give hyperlocal SEO the attention that they should. Next time you are sitting on a train or standing in a busy town centre, just look around you and count how many people are looking at their phones. You will be amazed, and possibly a little disturbed, by just how connected we are to our mobiles. There has never been a better time to put this to business use and tap your company’s marketing strategy into the smartphone generation. Oaxis, a leading consumer technology company, today announces the latest in its family of E-Ink cases, the InkCase i7 Plus for iPhone 7 Plus is now live on crowd funding platform Kickstarter. The multifaceted, scratch-resistant and now waterproof smart case merges the functionality of an e-reader with the convenience of a smartphone to bring users the world’s most advanced E Ink display for the iPhone 7 Plus. Following on from the massive success of the InkCase i7, the i7 Plus now has the latest Carta 1.2 E Ink panel; the most advanced E Ink screen available in the industry. The contrast is vastly improved where white is brighter and black is darker, a huge improvement when compared to the E Ink Pearl used in most e-reader devices, including the Amazon Kindle. This super thin case adds only 4mm of thickness to the iPhone 7 Plus and is surprisingly light despite its smart capabilities. The anti-glare screen absorbs the sun rays and reduces reflexion so you can now read a book on the beach! The screen area, now 5.2”, has also been increased by 40% from the original iPhone 7 and unlike other e-readers, has the added benefit of removing all distractions, including advertisements. Plus, with its “Read It Now” function, users can archive downloaded articles from mobile browsers and apps as well as multiple eBooks for the ultimate offline reading experience, without draining their iPhone’s battery. Oaxis has listened and acted upon customer feedback on its previous models and now the InkCase i7 Plus has the ability to offer push news functions; a self-learning algorithm to display news for individual users based on their preferred genre. This news function is also automatically transferred to the InkCase so you no longer have to manually sync them. To the relief of all, the new case has the added benefit of eliminating distractions by automatically removing all ads and annoying links, images and texts. To add a personal touch, users can further personalise their display wallpaper with a customisable template for live information centre widgets such as reminders, calendar, time or steps that day. 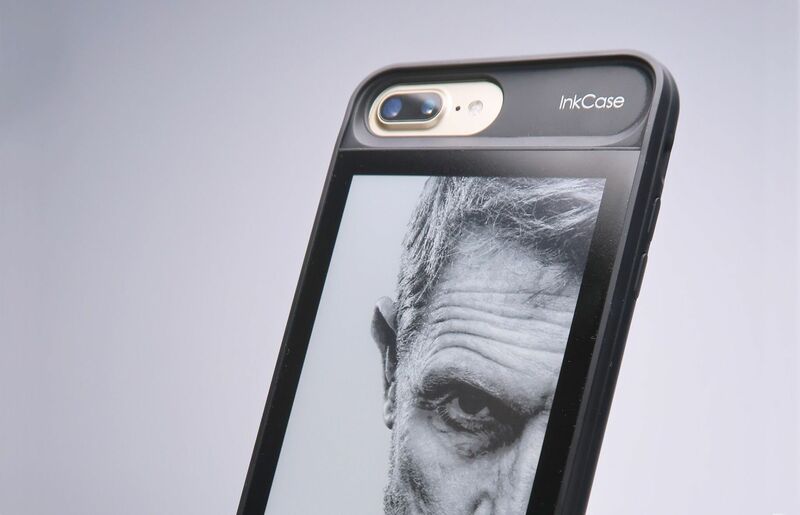 The InkCase i7 Plus allows users to edit photos via the InkCase iOS application and Bluetooth technology and now features a selfie assistance feature. This is a real-time reflection of the rear camera view, so users can ensure they are in the frame to capture better quality selfies than they would if using the less impressive front facing camera. The InkCase i7 Plus also features functionalities including receiving push notifications, creating task lists, and tracking physical activities with the Health App integration. To ensure a great performance, the InkCase i7 Plus’s memory is equipped with 128MB RAM and 256MB internal storage. With an IP67 rating, the case is also now waterproof, dust proof and sand proof and with the shockproof case now utilising BubblePro Technology, you can be sure your device will be fully protected. Don’t own an iPhone 7 Plus yet or planning to upgrade? No problem! For those considering purchasing the iPhone 8 in September, Oaxis will offer backers the unique opportunity to return their InkCase i7 Plus and upgrade to the next InkCase for iPhone 8 with a generous discount of 50%. Oaxis are also offering regular iPhone owners the opportunity to get involved and support the campaign. For just US$50 (£39.23), Oaxis will give backers an InkCase IVY (smart case with E-Ink screen designed to conserve phone battery and serve users daily reminders, tasks, and notifications) worth US$69 (£54.14) and US$75 (£58.85) depending on design AND a US$50 (£39.23) cash voucher that can be used on oaxis.com to purchase the InkCase i7. No one needs to miss out on this great campaign! 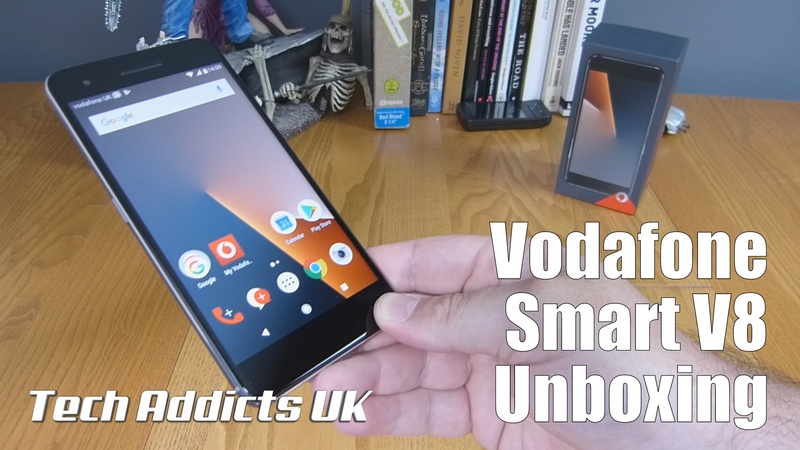 Vodafone has very kindly sent over the Vodafone Smart V8 following a small private launch in the London last week. A phone aimed squarely at the business arena the Smart V8 features decent specs to get you through the day but more importantly should also appeal to the broader market. The ZTE built phone features an attractive and premium feel with the metal exterior and smooth metallic sidelines. If like me, you have an older house, you will no doubt know the pain of mixing Wi-Fi and solid walls. Couple that with limited phone access points on the ground floor only and you are really up a creek. 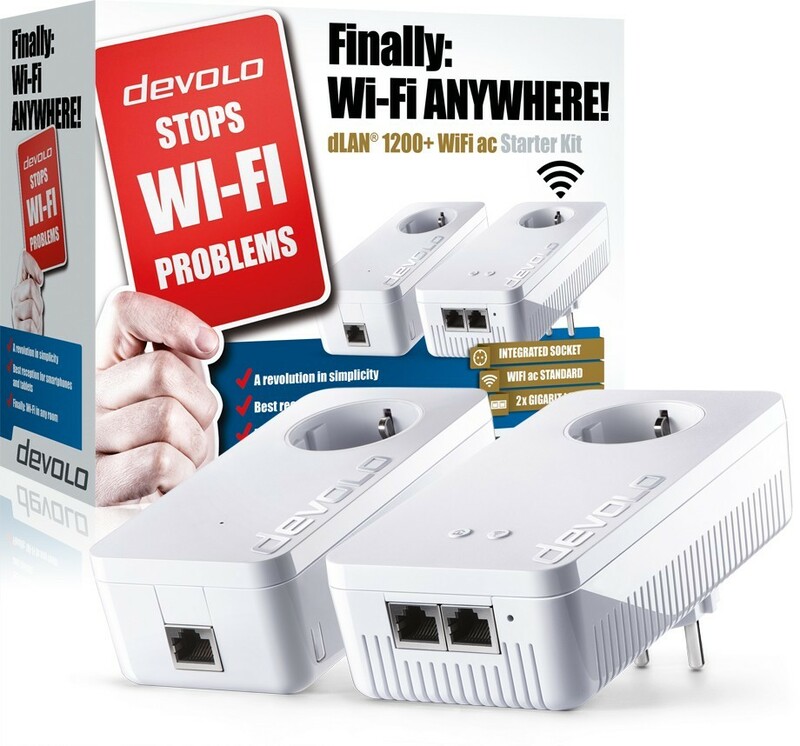 Devolo has a handy dandy solution for you with their dLan 1200+ WI-Fi AC. Using your home’s electrical system, these neat little units will provide a Wi-Fi signal in places your standard router just can’t reach. 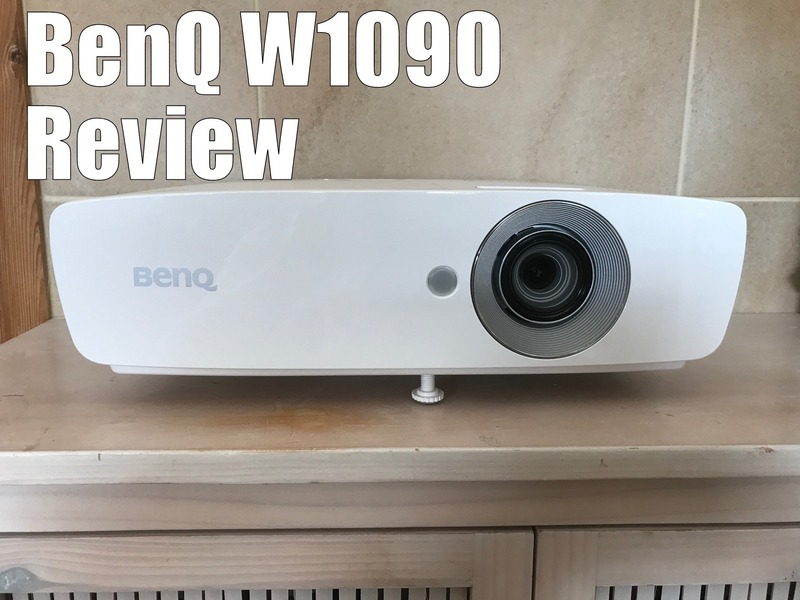 The devices themselves aren’t exactly small, but they are nicely featureless white boxes with minimal amounts of buttons and lights – perfect – who wants their living room to look like a set from Star Trek (now Star Wars…that’s a different matter!). I particularly liked the fact that they also have a pass through plug socket in them so you aren’t taking up valuable power outlets. Nice touch. The Ethernet ports are on the top of the unit, and this is both a benefit and a drawback. Given the size of the units, if you have one plugged into a low power outlet and the ports are on the bottom, you may be pushed for space getting the cables plugged in with enough clearance. Having the ports on the top not only gives any amount of clearance, it also allows for easier access. On the downside, there is an aesthetic penalty involved with having the ports much more visible and being on the top, they can now become little dust catchers. A simple removable cap/cover would provide an obvious solution. I used a little white electrical tape and it looks fine. Setup appears simple thanks to some rather basic Ikea style instructions provided by Devolo. It has lots of big pictures, so even the technically inept like myself should be able to have it up and running quickly and easily. There are two setup options, one for providing a Wi-Fi signal for a standard router, and another to clone the signal from an existing wireless network. In my case, it was the latter. Plug in the main unit and connect it to the router with the provided Ethernet cable, wait for a few seconds for the light to appear. Plug in the additional unit(s) nearby, press the home buttons, hit the WPS button on your router and Badda Bing, you are up and running about a minute later. Once all the lights have turned white, you can unplug the adapters, position them anywhere in your house and they will provide you with gloriously speedy Wi-Fi (rated to speeds of up to 1,200Mbit/s). It is as simple as that. Or at least it should be. I will hold my hands up and admit that I am most definitely a key person when it comes to these things and maybe it was just me, but when I initially set up the adaptors to clone my Wi-Fi and went in the settings on my phone, I found that the activated adaptors showed up as new separate networks on my list. It was easy to simply log on to each one and enter the password that is printed on the back of each device, but that would mean manually changing from one network to the other depending on where I was in the house. The adaptors are capable of replicating the SSID and password for your existing network so I tried again. The downside with the picture orientated instructions is that whilst simple is good, there is such a thing as too simple. I followed the instructions carefully again and got largely the same result, but this time one adaptor showed up as a separate network and the other was replicating my original. Eureka! What the instructions don’t make very clear is that if you are adding multiple adaptors, you need to activate them individually, one at a time. Trying to do them together does not work. Problem solved. Once you have everything in place, you can basically just leave it all alone and there is no need to ever go near them again. That’s the kind of tech I like! One little hiccup I noticed was that when setting up the Devolo, it did knock some off my devices off the network. My iPhone, for example, would no longer auto-connect to it, nor would my sky box or Xbox, whereas my computers, iPad etc were all fine. Simply resetting the network connection on the affected devices and logging back in solved the problem though and it has not reoccurred. Now I have a single Wi-Fi network that operates in every corner of my house and out into the garden too. My phone automatically locks on to the strongest signal available completely seamlessly. You can even tinker with the network from your phone or tablet by using the Devolo Cockpit app if you feel so inclined. Splendid, I can now watch Netflix in the bath and play Contest of Champions in my back garden – life is good. Of course, all this convenience comes at a price and quite a hefty one at that. The master unit comes in a pack with one adaptor for £159.99, although shopping around, I managed to find it for £139.99. Each additional unit will cost around £109.99, so it’s not exactly cheap, but it does work very well. I actually really like these units. They are quick and easy to set up (even if you have to redo it), unobtrusive and they just work. You can’t ask much more than that. So if you have dead zones around your house and have a few quid to spare, the Devolo dLan 1200+ WI-Fi AC Powerline kit is just the ticket. F-Secure Sense Unboxing. The best home security for IoT? 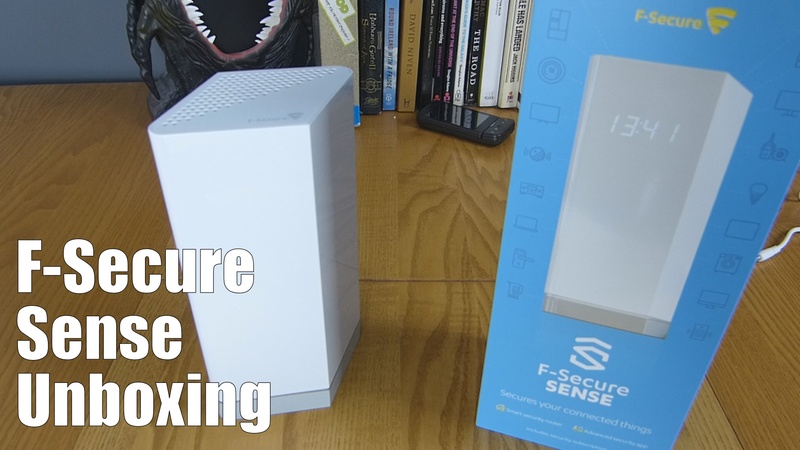 F-secure have sent over the Sense, new security device designed to sit between your router and connectable devices and give the user peace of mind with a high-level security banner to foil hackers and malware. Smartphones, Tablets, Televisions, Baby monitors all could potentially have a backdoor allowing hackers to steal private information. SENSE it will act as a guardian protecting your home from any potential threats. For more information, check out the article by Peter who attended F-Secure’s Sence launch. Click here for F-Secure’s Sense website. Has F-Secure created the best cyber security system? Not so long ago the world was a simpler place the internet was used to check emails and if you wanted to know what your friend had for dinner you asked them on your landline. With the growth of technology and faster internet connections a whole new world of possibilities evolved. It was a magical time when the impossible was made possible. A time where we waited patiently for a website to load and hoped that the connection was not disrupted with someone using your home phone. It was 1995 and I went to watch ‘The Net’ starring Sandra Bullock as a young computer programmer, Angela Bennett. This was the first time I witnessed computer hacking, I recall being completely horrified as Miss Bennett’s digital identity was erased and replaced with a new identity as Ruth Marx a wanted criminal. This was almost a science fiction thriller, the technology we had back then was nowhere near as advanced in this movie and as I left the cinema I thought this could never happen to me, could it? Complacent with my anti-virus software I felt that this was enough to protect me. Fast forward to the year 2017 and we are so technology dependent the millennials could never have coped with life in 1995 nowadays your friend who you have not spoken to in real life for years posts what they had for dinner and you click a like button to show acknowledgement. We post our whole lives online, which can be argued to be a positive thing but if your home was hacked and your digital identity erased how much of your life would you lose? The 12th May 2017 was the beginning of the worldwide cyberattack of the ‘WannaCry’ ransomware which targeted computers running Windows by encrypting data and demanding ransom payments in the Bitcoin cryptocurrency. The world had its first wake up call that cyber attacks are a potential threat and that normal people can be affected. In Britain, the NHS were affected and the ‘Wannacry’ threat dominated headlines making the average Joe take notice. There is now an awakening that there could be a loophole in people’s security software. Perhaps smart devices have the potential to work against you if you do not have the right protection. The smart move is to be prepared and not be in a position to get hacked in the first place. Thankfully F-Secure a Finnish cyber security and privacy company established since 1988 have been working on a device to protect your home network and the forever growing number of IoT devices. 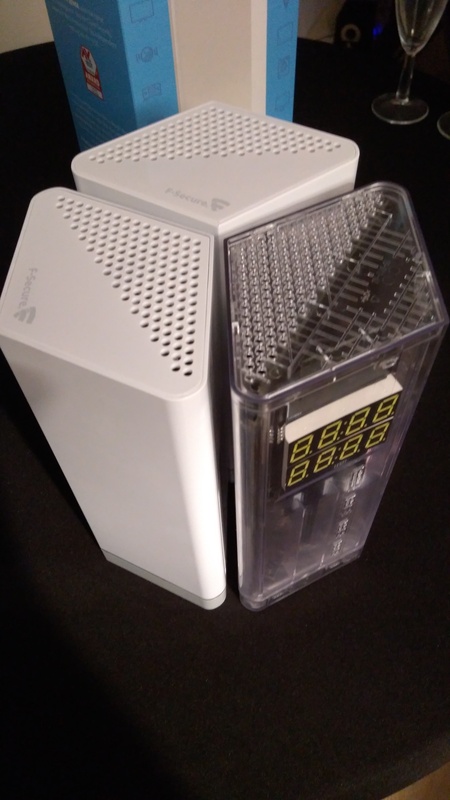 They have developed F-secure SENSE which offers a three layer protection; Firstly with the SENSE router that you connect to your existing router in your home, secondly the SENSE advanced security app allowing you to manage your home network and protect devices, even outside the home, and third, they have developed cloud protection which monitors your network for threats in real time. SENSE creates a complete secure home network that will prevent personal private information being shared with companies without your permission. SENSE was unveiled last month at The Next Web conference held in Amsterdam. Mikko Hypponen, Chief Research Officer from F-Secure gave a speech about the internet of insecure things and captivated the audience with a tale on how your toaster will soon be connected to the internet, not for any benefit to you but the manufacturer. He also discussed how people do not read instruction manuals and how back in the 80’s and 90’s video tape players all had a flashing display of 12:00 as no one had the patience to sit and programme the time. F-secure SENSE was unveiled to a select few journalists and bloggers from Europe where we got to see the router in action. Harri Kiljander, Director Customer Experience Design Consumer Cybersecurity demonstrated how the SENSE app and router work. Check out a short interview with Harri on the Techaddicts podcast here. The app was simple to use as he connected two mobile devices to the router and demonstrated how the app would pick up a malicious website. Ultimately there will be other security routers similar to SENSE appear on the market but F-secure promise ongoing automatic updates that will be free, making every SENSE network even more private. Shipping now £169 with free delivery you receive the SENSE router plus one year’s security subscription. Subscription costs £8.50 per month after the first year. F-secure have developed a product that in theory sounds like a device that every home will need, the monthly subscription is a small price to pay for a piece of hardware with software that will update to protect your home and IoT devices against computer viruses and hackers. Without the subscription, SENSE still functions as a powerful router. We will be unboxing and providing a full review within the next month here on the Tech Addicts. Winner of numerous awards including the “Best of Award” for home theatre review and 2016 winner of the Richard Beers Innovation Award, the Triple Driver In-Ear headphones have been expertly tuned by Grammy Award winning sound engineer Luca Bignardi to deliver a precise representation of a listener’s favourite music. The two balanced armatures and a separate dynamic driver deliver an extremely powerful yet intimate listening experience which together create a spacious and transparent feeling of having nothing between users and their music. The patented armatures work together to deliver sizzling highs and can withstand extremely high input power without distortion. They have an extended frequency range up to 40,000 Hz to reproduce high-resolution audio – frequencies in this range add “transients”, a sonic quality normally only heard in live music. The armatures are uniquely inset with durable silicone covers for lasting performance and resilience. The patented triple layer driver with aerospace grade metal inside two outer layers of PET, a resilient polymer, greatly increases bass and midrange response time, definition, and fullness. The headphones are comprised of a lightweight aluminium body with an interior enamelled copper wrapped around Kevlar cable to increase durability and strength. The surface of the cable is enhanced by TPE for softness and comfort with a final braided layer of nylon for lasting resilience and tangle resistance. The oblique angled ear fittings naturally match the ear canals and the snug fit increases noise isolation, fullness, and bass to ensure a fully satisfying listening experience without the need for unhealthy volume levels. There are 6 sets of different ear tip sizes included to ensure a good fit for all ears. The Triple Driver’s dual-system intelligent control technology also supports both Apple devices and mainstream Android devices, solving the in-line control compatibility between the current Apple and Android system, allowing users to turn up or down the volume and select between songs. The headphones also have hands-free calling capability where problematic cross-talk is a thing of the past with ground wires set independently to provide a high fidelity sound experience so users can focus on their conversations, instead of background static. Additionally, the single-sided control is control is conveniently located for easy access when it is required to take a call. 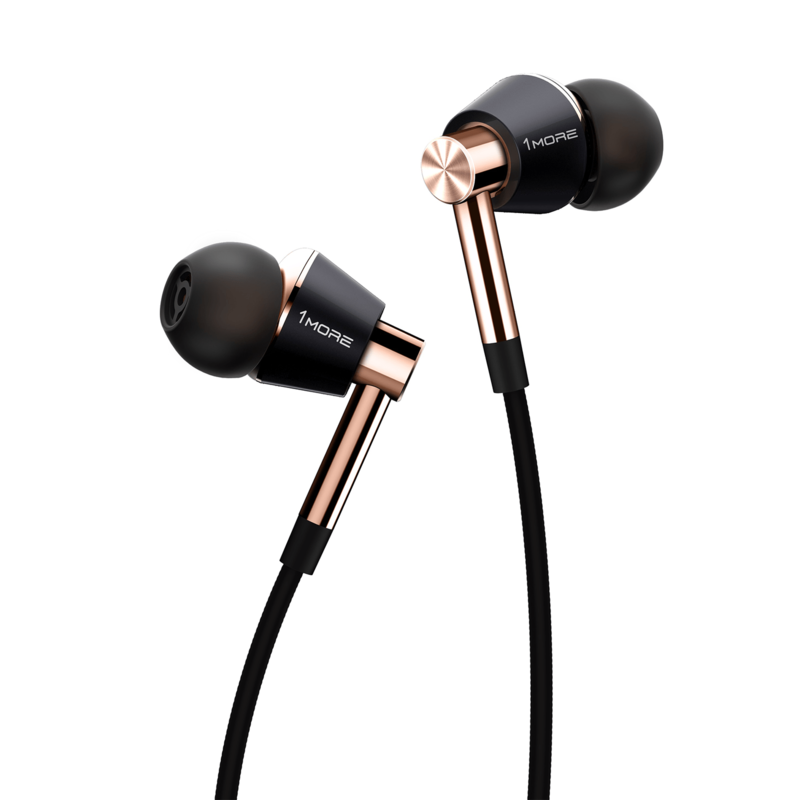 Available for just £99.99, the 1MORE Triple Driver in-ear headphones deliver a spectacular sound at amazing value when compared to other headphones of similar specifications available in the market. 1MORE are proud to be superior to the industry standard.